On November 1st I flew to Orlando for my Wine & Dine Half Marathon Weekend adventure, but back in August a surprising opportunity presented itself. I was looking at the Disney World website and realized that the very last Mickey’s Not-So-Scary Halloween party of the season was being held at the Magic Kingdom the day I arrived. I was willing to move heaven and earth to be able to attend, but would it be enough? The party was starting at 7 PM which was the same time my flight was scheduled to land. However, the celebration lasted until midnight so even if I got there a couple of hours late I would still have plenty of time to enjoy the festivities. There was hope! So I optimistically purchased a Halloween party ticket and prepared myself as much as possible for my busy November 1st schedule. First of all, I tagged my suitcase so that Mickey’s Magical Express bus service would pick it up from baggage claim rather than waiting for it myself. That saved me a little time. Second, I checked in to my hotel online so I could skip the front desk. And third, I slept quite a bit on the plane so I could more easily stay up late and savor every minute of the Halloween party. I ended up walking through the Magic Kingdom gates a little after 9 PM. As much as I love Disney World, the main reason I wanted to go to Mickey’s Not-So-Scary Halloween party was to see the seasonal fireworks, parade, and Hocus Pocus live show. Before picking a spot to watch the HalloWishes Fireworks I did a little trick or treating. There were several spots around the park where cast members dole out handfuls of candy so it didn’t take long for my little bag to be completely full. It took me the rest of my trip to finish all of it! I grabbed a salad for dinner to counteract the sugar rush, and then I made my way back to Cinderella’s Castle for the fireworks t 10:15 PM. Disney World sure knows how to put on a show. As a Disneyland native I wasn’t expecting the fireworks to come from so many different locations! It was really amazing. 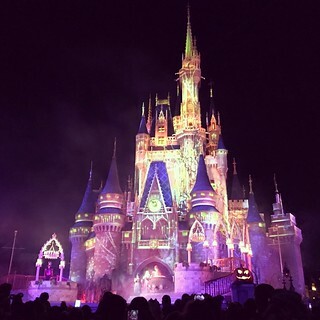 Next everyone crowded around the castle for the Hocus Pocus Villain Spectacular at 10:45 PM. This show was worth the (relatively high) price of admission. The actresses were great, there were a lot of laughs, and the music gave me goosebumps, especially “I Put A Spell On You.” It was incredible There were a lot of reasons that going to the Halloween party was impractical for me, but when I saw the Hocus Pocus show I knew I had made the right decision. Take a look at a short video I took of the finale to see what I mean. The last Boo-to-You Halloween Parade of the night took place at 11:15 PM so I hung around the castle for that after Hocus Pocus was over. It was the perfect way to say goodbye to the Halloween season. Before leaving Magic Kingdom I walked around the park some more (and I’ll confess to gathering some more candy) to drink it all in. I finally got on the bus back to my hotel around 12:30 AM very happy with my decision to go to the Halloween party and make my November 1st as insane as possible. I wouldn’t have had it any other way. On Sunday morning my alarm didn’t go off at 3 AM like the two previous days, but at 2:45 AM instead! I figured I needed an extra 15 minutes to apply all of the necessary sunscreen before catching the bus to the start line. Daylight saving time ended shortly before I woke up, rolling the clocks back one hour, so the sun would be rising earlier as far as the clock was concerned. I’d definitely be running part of the half marathon in the sunlight and I had to be prepared. The upside of DST ending was that I fell asleep at 8:30 PM the night before, which was equivalent to 7:30 PM, so I got 7 full hours of sleep! That’s hard for me to do when my schedule is so out of whack on vacation. 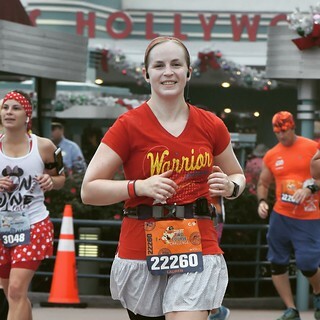 I picked my Wonder Woman shirt and white sparkle skirt to wear for 13.1 miles. The last time I wore those items was for the Long Beach marathon a few weeks earlier and it was such a miserable experience that I wanted to have a more positive memory associated with that outfit. Spoiler alert – it worked! It was very humid on Sunday morning so I was sweating like a pig, but the temperature was as low as I could have hoped for central Florida in November. 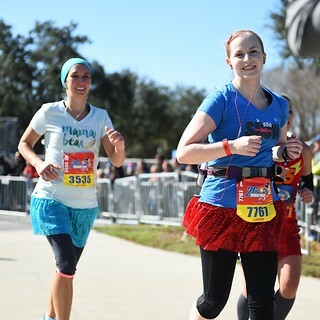 Similar to the 10K, the half marathon started in the Magic Kingdom parking lot and went south, so the first three plus miles were on boring access roads. But after that we ran through Animal Kingdom, and this time I got to see the new Pandora area in the daylight. It’s absolutely amazing! After leaving Animal Kingdom we had another few boring miles before getting to Hollywood Studios, but that was quickly followed by the Boardwalk resort hotel area and Epcot. I actually enjoyed the last 5K of this half marathon, which is usually the hardest part of the race for me, due to the clustered entertainment along those miles. It was a lot of fun. My time wasn’t amazing, but it was better than I initially expected after my slower than average summer and fall running so I was happy. I was even happier to pick up my half marathon and Two Course Challenge (10K + half marathon) medals after crossing the finish line. Afterwards I hopped on the bus back to my hotel so I could shower, scarf down some Mickey waffles for breakfast, and take a nap! I needed some rest before going to Animal Kingdom later that afternoon for an amazing dinner at Tiffins (pea fritters, venison tenderloin, and sorbet) – seriously, everyone needs to eat there – and the Rivers of Light evening show. I skipped the Wine & Dine post-race party at Epcot that night because it didn’t start until 10 PM and I was dead tired much earlier than that. Repacking my suitcase to fly home the next day and getting a good night’s sleep were more important. than staying up late for the party! The theme of this vacation was doubling the number of miles I had to run each morning. (My January trip will have a similar theme, but it will be a startling four mornings, rather than just three. Doesn’t that sound like fun?) So on Saturday morning, much to my chagrin, my alarm again went off at 3 AM so I could get ready for the Wine & Dine 10K. This is what I signed up for on this vacation! Fortunately my pre-race preparations were minimal because the entirety of the race would take place before sunrise, same as the 5K. No sunscreen required! For someone who takes sun protection extremely seriously, bordering on obsessively, not having to slather greasy lotion all over my exposed skin at 3 AM is a huge convenience. (One of the reasons I love winter is having more hours to run in darkness. I cannot wait to get back to Los Angeles to enjoy the earlier sunsets and lovely fall weather.) To continue the Avengers trend I started the day before, that morning I selected my Hawkeye shirt and a black skirt. I don’t get to wear black running shirts often because they get so darn hot in the sun, but luckily that wasn’t a factor this time! 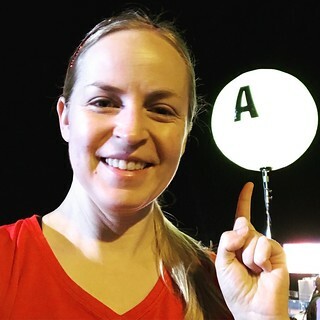 I jumped on the bus to the 10K start line at 3:30 AM. It was just chilly enough for me to use a mylar blanket to keep warm while waiting for the race to start at 5:30 AM. Usually I get annoyed at the DJs who “entertain” the crowds that early in the morning, but this one conducted a lip sync battle between the corrals of runners and it turned out to be surprisingly delightful. It was certainly more fun that sitting there doing nothing for hours. I always read a book on my Kindle app since there is so much time spent waiting around, but singing a bunch of great songs was a much more engaging way to pass the time. Once the race began I didn’t cross the start line for about 15 minutes since I was in corral C. The 10K started in the Magic Kingdom parking lot, but didn’t actually run through that park. (It’s a shame because it’s my favorite.) Instead we made our way south for a little more than three miles before briefly entering Hollywood Studios. The Christmas decorations and music there are fantastic. After that we headed to the Boardwalk resort hotel area, and then to through a portion of Epcot before finally hitting 6.2 miles in the Epcot parking lot. The weather was beautiful that morning, the second half of the course was lovely, and I got back to my hotel in plenty of time to take a nap before I needed to be at Epcot for my first Fast Pass. A decisively successful morning! My vacation is rapidly coming to an end. It’s been a busy trip, but also a heck of a lot of fun. I haven’t written about the 10K (yesterday morning) and half marathon (this morning) yet, but I survived and even enjoyed both races. More on those when I find enough time and energy to compose some comprehensive posts. Anything I write right now it going to be incomprehensible babble. I’m exhausted after waking up really early three days in a row, and then spending a lot of time exploring the Walt Disney World Parks after the day’s running was complete. I’ve been on the go and on my feet a lot over the last four days. After the half marathon I tried to sit down and draft a decent blog post about the 10K, but I couldn’t put together more than a couple of sentences before I was in desperate need of a nap. I’m flying home tomorrow night (I’d rather have an early flight, but I didn’t have another choice on Virgin America) so I’m hoping to have some time either at the airport or on the plane to publish something more extensive that this little paragraph. But right now I’m going to round up everything in my hotel room and try to somehow fit it all back in my suitcase. A seemingly impossible task. Wish me luck! Yesterday morning my alarm went off at 3 AM and I was so groggy that couldn’t immediately remember where I was. I have many early wakeup calls due to training and races that you’d think I’d be used to it by now. I blame this particular confusion on being in a strange hotel room. I was still really sleepy, but I had to scramble to get ready for the Wine & Dine 5K at Disney’s Animal Kingdom Park. Actually, it was rebranded as the Fall Feast 5K this year which is a shame because it used to be a Christmas-themed race. It would have been the perfect way to kick off the post-Halloween season. With the new race name I was tempted to wear my Thanksgiving running shirt, but I decided against it. When I was packing for this trip I realized that I own six or seven superhero running shirts – more than any other category. They are by far my favorite. Given that there are only three Avengers races at Disneyland next weekend (of course I’m running all of them) I decided to extend the superhero theme to the Wine & Dine weekend as well so that I could wear as many of the shirts as possible. 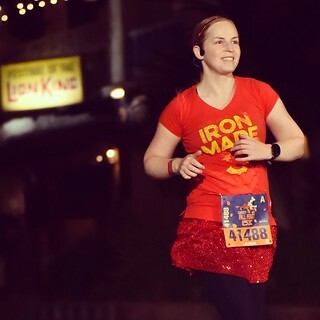 This morning I picked my Iron Man shirt and a red skirt for the Fall Feast 5K. I was in corral A for the 5K which was a rare treat. I was one of the first runners to cross the start line at 5:30 AM. Funny enough, after I finished the race and was walking to catch the bus back to my hotel the final corral was finally crossing the start line! That was surreal. It was a really fun 5K running through Animal Kingdom. I think it’s my favorite Disney World park to run through. We got a glimpse of the new Avatar area as well, but it was so dark I didn’t recognize anything. I’m planning to go back tomorrow and take a better look, assuming it’s not completely packed! I got back to my hotel room after the Fall Feast 5K long before sunrise which gave me plenty of time to shower and get ready for my breakfast reservation at Magic Kingdom at 9:30 AM. One Wine & Dine race down, two to go! This morning was the Wine & Dine 5K (officially rebranded as the Fall Feast 5K this year, but I’m not a big fan of that name) and I intended to write a whole post about it tonight, but I’m so tired that I can barely keep my eyes open. I’m sitting in my hotel room watching this week’s new episode of “Once Upon A Time” and dozing off briefly every commercial break. I can’t wait to take a shower and climb into bed. My alarm went off at 3 AM this morning for the 5K, and it’s set to the same time tomorrow morning for the 10K. Yikes! These races always sound like a good idea when I sign up for them, but are less appealing when I have to get up so many hours before dawn. I will try to devote more time to writing tomorrow so I can share a full account of the Wine & Dine 5K, but for now it’s bedtime. Good night! Whole30(-ish) blogging in October was the perfect segue into NaBloPoMo 2017. I’m already in the habit of updating my webpage every day which is a plus, but November has traditionally been an extremely busy month for me. Case in point, I’m at Walt Disney World right now for the Wine & Dine Half Marathon Weekend which means that my normal routine has been thrown out the window. I’m sitting down to write this post in my hotel room before an early bedtime in order to be ready for the Fall Feast 5K at 5:30 AM tomorrow morning. It’s my first of three pre-dawn race mornings. Not the kind of thing most folks would sign up for on their vacations, but we runners are a little bit crazy! This morning I went to the race expo and picked up my race bibs and shirts for the three races. Actually, I slept in and barely rolled out of bed in time to get to the expo when it started. 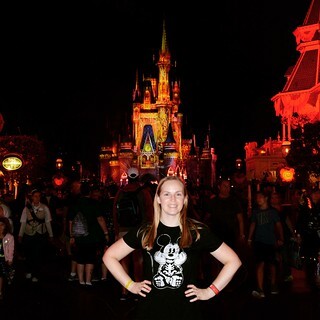 Last night I went to Mickey’s Not So Scary Halloween Party at Magic Kingdom and I stayed until after the park closed at midnight. Very uncharacteristic for me, but the party was amazing and totally worth the effort it took to get there after my flight landed yesterday. I’ll write a separate post about that later. I spent most of the afternoon at Hollywood Studios visiting a few rides that are no longer at Disneyland, like Tower of Terror and Muppet Vision 3D. So much fun. But now it’s time for me prepare for the 5K early tomorrow morning. 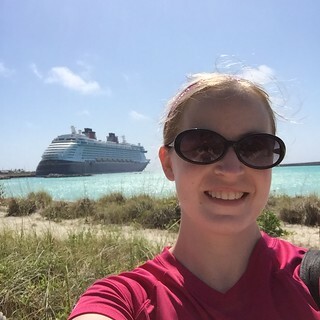 I have big plans for the rest of this runcation and I need to be well-rested to fully enjoy it! I had big plans for my birthday (January 9th) at Disney World, which just happened to be the day after the marathon. 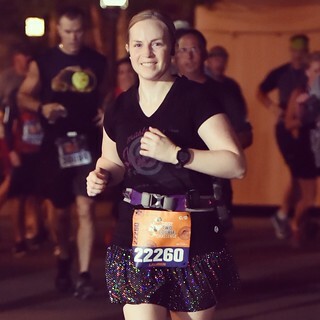 To celebrate not only turning 38, but also successfully completing my first 26.2 mile race, I had several reservations booked throughout the day at different Disney parks. First was breakfast at Be Our Guest in Magic Kingdom. If you haven’t eaten there before it’s a beautiful place with three different dining rooms that are impeccably decorated like the Beast’s castle. I had a delicious meal of quiche and pastries in a spectacular ballroom setting. The Magic Kingdom is my favorite Disney park so my parents and I spent a lot of time there after breakfast. As soon as we arrived that morning I made sure to get my birthday button so just about every Cast Member we encountered all day wished me a happy birthday. I also wore my Disney World Marathon shirt to the parks that day to advertise my accomplishment, but it was cold enough to warrant wearing a jacket over it most of the day. In the afternoon we caught a bus from the Magic Kingdom to Hollywood Studios where I had an early dinner reservation at Sci-Fi Dine-In Theater Restaurant. The opportunity to have a meal in a booth shaped like a car at a drive-in movie theater was too intriguing to pass up. And it was a lot of fun. The food wasn’t very impressive, but I loved watching the old sci-fi movie trailers, clips, and cartoons while eating. But by far the highlight of the evening was the Star Wars Galactic Spectacular Dessert Party. Rather than have a birthday dessert with dinner I made reservations for all three of us for the dessert party preceding the Star Wars fireworks, which also came with priority viewing for the show. The party was in the Star Wars Launch Bay and I ate more than my fair share of indulgent sweets to celebrate my birthday. It was great. 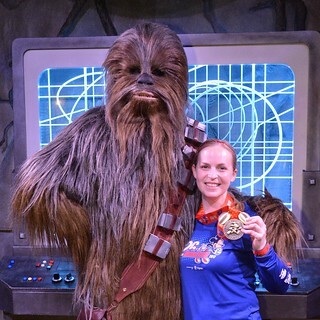 I also got my picture taken with Chewbacca where I was able to show off my marathon medal. And then Star Wars Galactic Spectacular Fireworks were really incredible. For a nerd like me it was the best way to end a birthday. January 10th was my last full day at Disney World, but it was a little less structured. After breakfast my parents and took the bus to Disney Springs and spent the morning doing a little shopping there. We ended up being pretty frugal, only buying some Disney t-shirts at Uniqlo. They turned out to be the perfect souvenirs from our trip, and much more affordable than anything from the parks too. Our only obligation for the day was dinner at Hollywood Brown Derby restaurant in Hollywood Studios. It turned out to be one of the best meals that we had the whole trip with salads, steak and duck entrees, and delicious desserts. It was a fixed-price meal that included priority seating for the Fantasmic show later in the evening. Fantasmic has been on hiatus at Disneyland for over a year now due to extensive construction so I haven’t seen it in a long time. And the viewing options are much better at Disney World anyway with stadium bleacher seating. I really enjoyed seeing the show again. 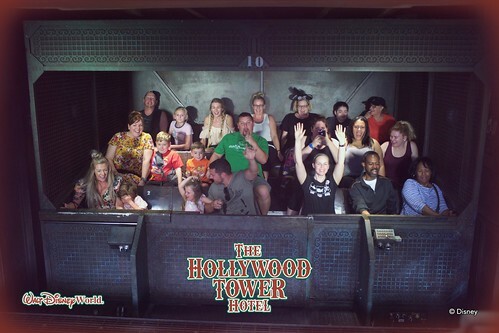 As soon as we got out of Fantasmic I made a beeline for Tower of Terror in order to use the Fast Pass I’d reserved. At Disneyland Tower of Terror closed permanently on January 2nd (I wrote a whole post about the last time I went on it back in November) to be transformed into a “Guardians of the Galaxy” ride so I was excited to be able to still be able to experience the Disney World version. It’s a bit more elaborate than the one in Anaheim was so it was an enjoyable surprise. I flew home to Los Angeles on January 11th, but my flight wasn’t until the evening so had a chance to spend a few more hours at a Disney park before departing. I decided to go back to the Magic Kingdom and get on some rides that I missed on my birthday. Like Space Mountain, the Peoplemover, Jungle Cruise, Haunted Mansion, and Country Bear Jamboree. I also bought a Disney World 45th anniversary shirt and pin. I realize that the 45th anniversary was technically in the fall of 2016, but Disneyland was decorated for its 60th anniversary for over a year and a half so I figure the Disney World celebratory items were still applicable. I was really sorry to be leaving Orlando after such a great trip, including completing my first marathon and my 38th birthday, but it was time to get back to reality. I have a few souvenirs, a bunch of pictures, and even more great memories. And luckily I’ll be back at Disney World for the Wine & Dine races in November! I got to Orlando without too much trouble on January 6th. It was my first time having TSA Pre-Check clearance and I definitely enjoyed it. Not having to take off my shoes or jacket, and being able to leave my laptop in my backpack when going through security was definitely worth the minor hassle involved in getting cleared. When I arrived at the Boardwalk hotel at Disney World my parents and I had some pizza for dinner and made sure to get inside before the storms arrived that night. Even wearing earplugs the thunder and lightning woke me up overnight. It was quite the storm. Run Disney preemptively cancelled the half marathon for the next morning due to the storms so a lot of runners were not pleased. It was the best choice for everyone’s safety, but I understand their disappointment. Due to the rain we did almost nothing the morning of January 7th. The only thing I absolutely had to do that day was go to the expo and get my race bib for the marathon the next morning, but we waited until the rain was just about over before attempting that trek. The expo was a madhouse with not only the marathoners picking up their things, but also the half marathoners returning to get their medals for the race that didn’t take place. Some of them were really dedicated and ran 13.1 miles in the rain earlier that day so that they felt like they truly earned the half marathon medal. I applaud them for the extra effort, but I’m not sure I would have done it! Most of Saturday afternoon was unproductive due to the time required to get to and from the expo with the added ridiculous number of cars and buses that were trying to get to ESPN Wide World of Sports in the bad weather. It was nuts. Fortunately I picked up my bib and shirt, and purchased a skirt for the next morning, without too much trouble. That night I had a delicious pasta dinner at Trattoria al Forno (conveniently located at the Boardwalk hotel where we were staying) in preparation for the marathon the next morning. I went to bed as early as I could manage, but I was really nervous about the upcoming race. My alarm went off at 2:30 AM on Sunday January 8th. I got dressed and ready for the marathon as quickly as I could because I wanted to be on the bus to the start line at 3 AM. After the storms went through the previous day it was extremely cold on Sunday morning. I had arm warmers, gloves, a fleece jacket (courtesy of my mom), and a mylar blanket, but it still felt frigid outside. I had the foresight to sign up for Race Retreat which gave me access to a tent and breakfast before the race, but it was only marginally warmer inside. I could still see my breath as I was eating my banana with peanut butter! I was a bundle of nerves waiting for the race to start. I’d never run 26.2 miles before and I had no idea how it was going to go. I met my old high school friend Missy at 4:45 AM and we started the long walk to Corral L. While we were moving it didn’t feel that cold, but standing still was awful, especially when the wind was blowing. We were huddling close to strangers and stomping our feet to stay warm, but neither was really working. We finally crossed the start line around 6:20 AM (being in the 12th corral didn’t do us any favors that morning). I was so glad for all of the layers I had on even after we started running. I only took off my fleece jacket around mile 5, right before we reached the Magic Kingdom, and I kept the gloves on even longer because my hands felt so toasty warm. The arm warmers stayed on a bit longer, but had come off by the half marathon mark. The sun was plenty warm by that point, but anytime we ran through the shade we got a reminder of how cold the air still was. I was feeling pretty good for a majority of the race, but between mile 17 and 18 it started to go downhill. My stomach was upset and I was tired, and I basically felt like garbage. I expected to get a second wind eventually, but it never happened. Luckily I had Missy with me for moral support and we crossed the finish line in 5:28:41 which is a lot faster than I expected for my first marathon! I wasn’t in great shape after the race, though. My knee hurt, my foot hurt, and my body started going into shock when I got back on the bus to my hotel. Luckily a hot shower, a piece of pizza and a Coke, and some rest helped. Many hours of rest and relaxation later my parents and I walked over to Epcot. My foot was still really hurting, but I figured it would pass. I purchased the Disney World New Year’s pin that I wanted and we had a fabulous dinner at Spice Road Table that night. It was the perfect end to my marathon day!